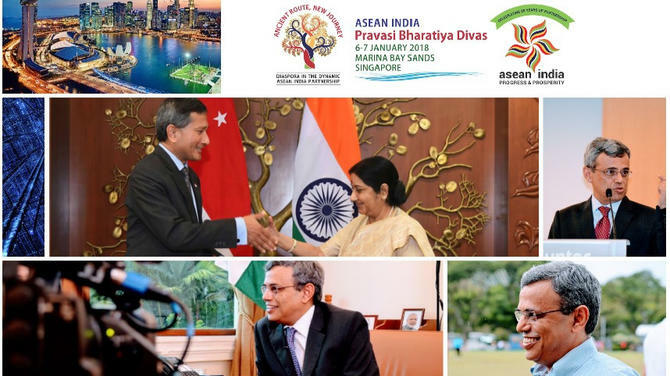 Indian Minister for External Affairs Sushma Swaraj drew a huge crowd to the Marina Bay Sands yesterday for the gala dinner marking the closing of the ASEAN India Pravasi Bharatiya Divas 2018. Singapore’s Deputy Prime Minister Teo Chee Hean was also present. 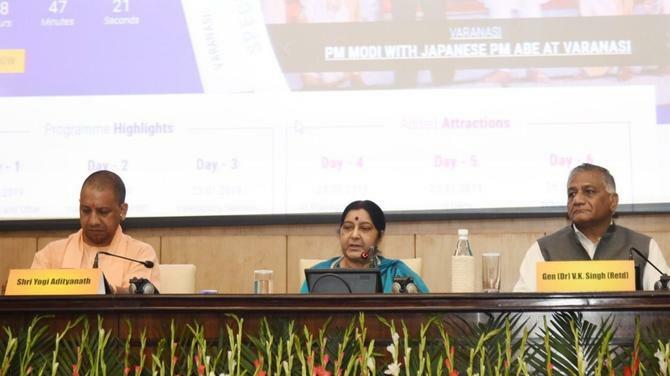 Swaraj had spent the day at the event, delivering the opening address in the morning before interacting with delegations of Indian-origin from the ASEAN countries and speaking again before a full house at the gala dinner. Delivering the speech largely in Hindi, the minister highlighted the versatility of Indians across the globe and reiterated the government’s commitment to ensure their talents, skills and potentials were recognised. She also stated that Indians abroad were ‘unofficial ambassadors’ of the nation and their actions and opinions shaped international perceptions of India. 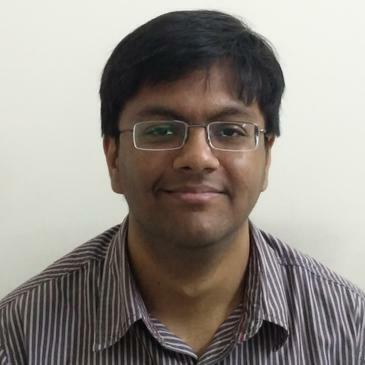 Introduced as the “people’s minister” by the High Commissioner of India, Singapore, Jawed Ashraf, Swaraj is known for using social media, especially Twitter, to handle problems faced by Indians abroad and foreign nationals. 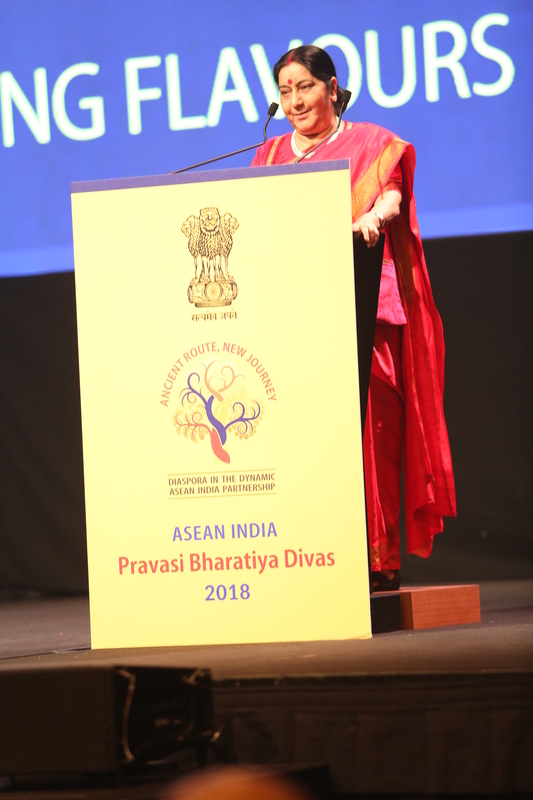 “The Pravasi Bharatiya Divas is my favourite event of all the programmes organised by the Ministry of External Affairs,” the minister said in her opening remarks. 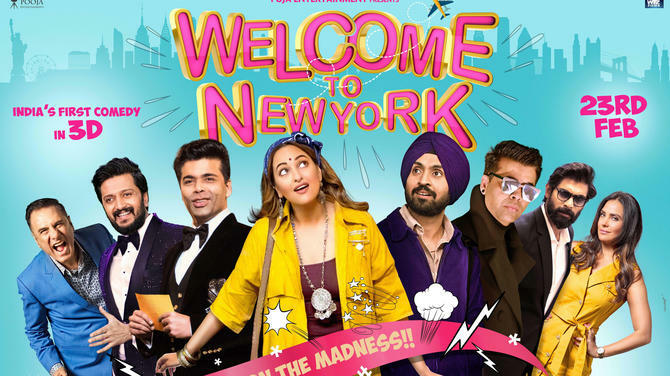 She added that she had heard three things about Indians living abroad; they were good neighbours, hard-working and law-abiding residents. 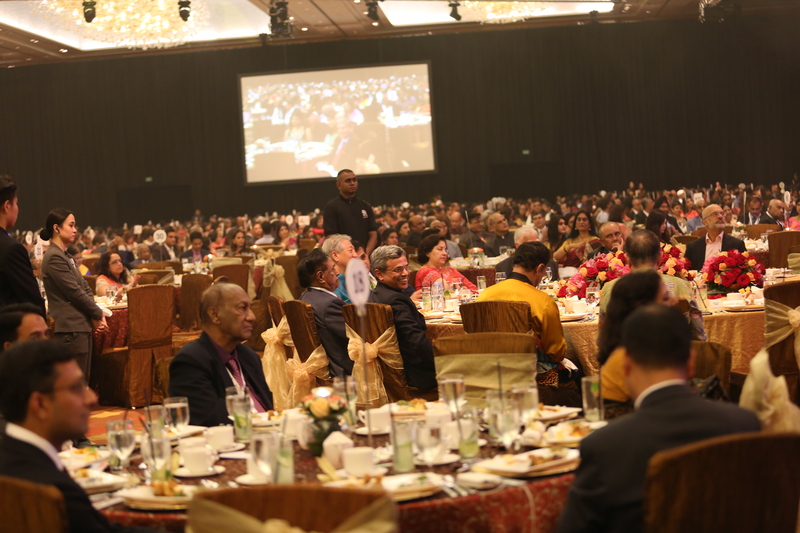 Over 3,000 people were present at the Marina Bay Sands Grand Ballroom for the EAM's speech and the gala dinner. 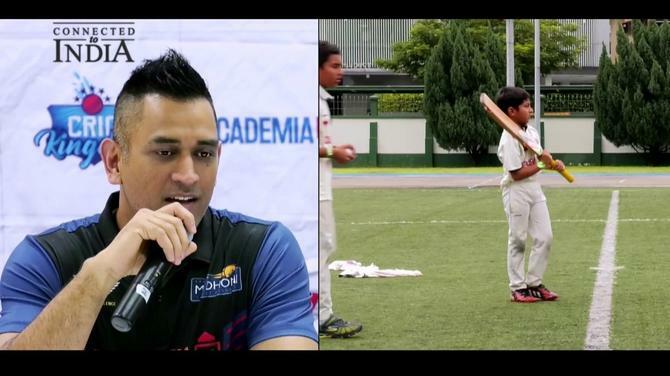 Photo courtesy: HCI, Singapore. 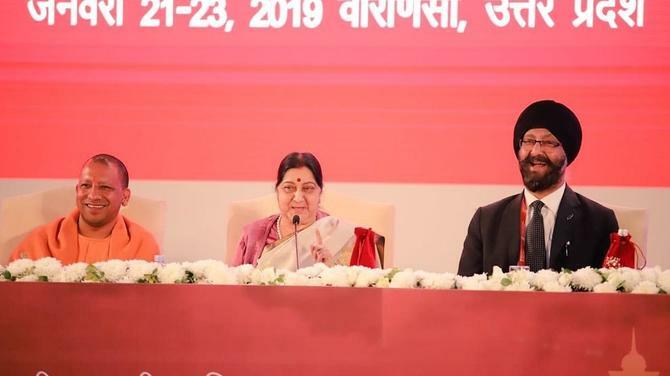 Swaraj in her speech also recounted how, until recently, the affairs of the diaspora was not a high priority for the MEA, attributing it to the existence of the Ministry of Overseas Indian Affairs (MOIA). She added that there was confusion of the division of labour between the two. 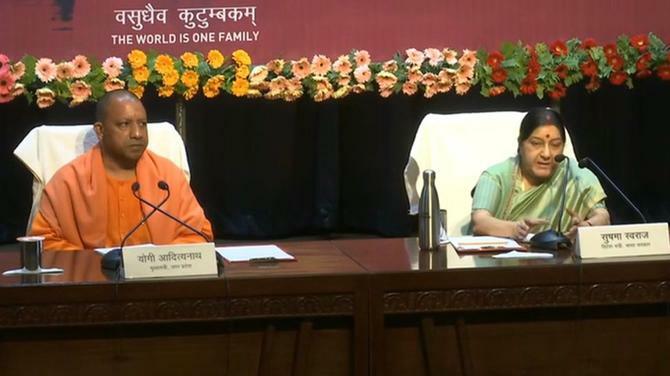 “PM Modi allotted me both the ministries, as their functions were complementary. However, I found that they had difficulties in coordination; I went to the PM and told him that the problem could not be solved by having one minister for both ministries, but by having one ministry. Then we would be able to make a difference,” Swaraj said. Swaraj went on to provide her perspective on her use of Twitter as a tool to solve the problems that came up. She praised the Indian High Commissions around the world for being alerted to any issue and taking steps to resolve them swiftly and efficiently. “We solve most problems within 10-15 minutes with a few tweets,” she said. “You can say we work at supersonic speeds.” She also praised the high commissioner and members of the government for leading from the frontlines during crises and being sensitive to the diaspora’s every mood. 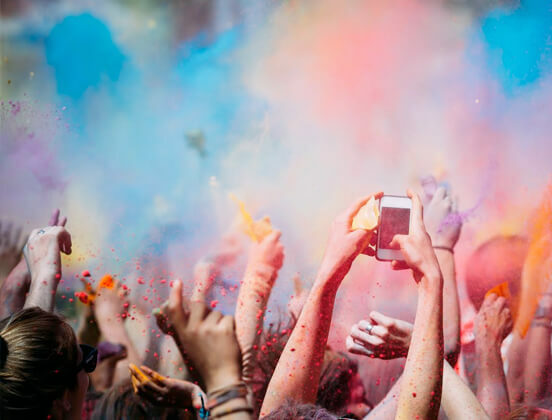 “India has not just changed; it has been transformed,” she stated. She concluded by recounting that she had told the PM that Singapore was the most appropriate venue among the ASEAN nations for hosting this year’s PBD, not just because it was taking over as the chair of the body, but as it was the nation which had proposed creating the original partnership agreement with India. 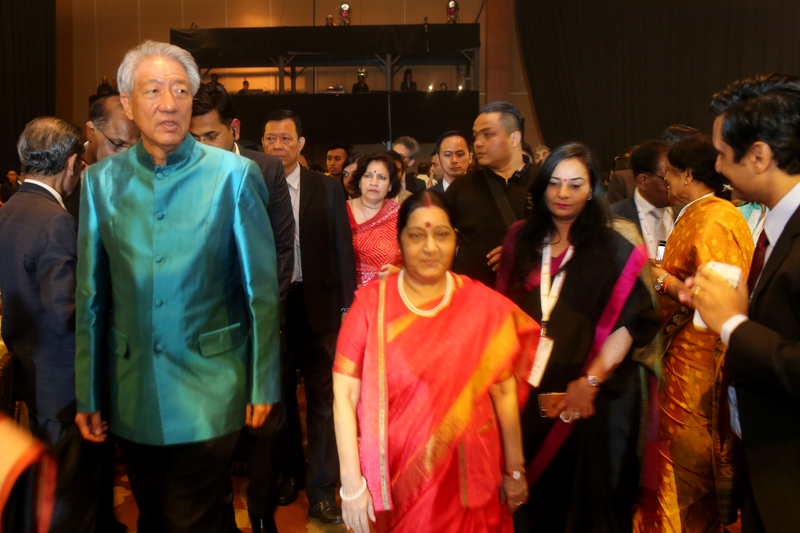 Singapore’s Deputy Prime Minister Teo Chee Hean, the guest of honour at the gala dinner, offered his congratulations to the MEA and the Indian High Commission in Singapore on a successful conference. 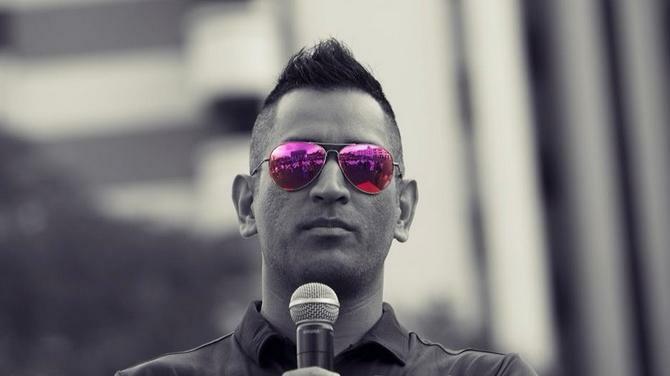 “India has played a major role in our region and has left a mark on language, food and religion. Over the years, the cooperation between ASEAN and India has expanded to include security, trade, tourism, education, and culture,” Hean said. “The Indian diaspora has played an important role to integrate India into our regional network, and can be counted on to do so in the future as well. 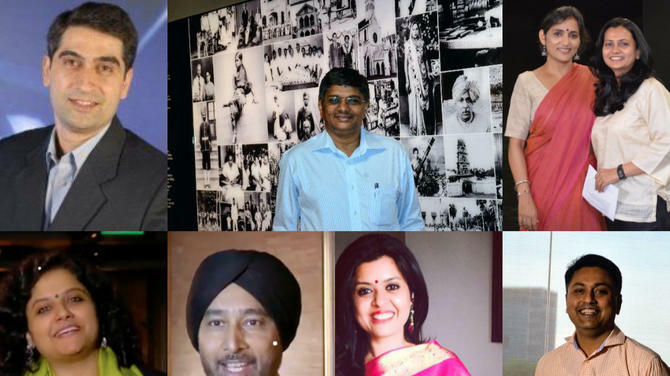 The strong, centuries-old socio-cultural links fostered by the diaspora have made it easier for Indian companies to strengthen their regional presence. 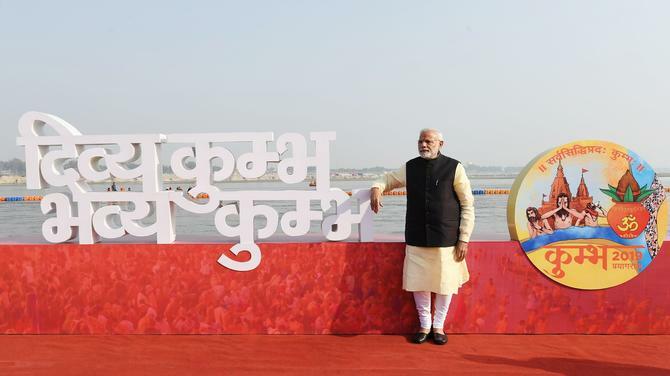 Similarly, the diaspora acts as a catalyst to forge greater business links from our region into India,” the Dy PM said. He added that India has participated actively in ASEAN-led cooperation platforms, such as the ASEAN Regional Forum, the ASEAN Defence Ministers Meeting Plus, or ADMM+, and the East Asia Summit and trade relations have been enhanced by the ASEAN-India free trade agreement which came into effect from 2010. Trade between ASEAN and India has risen steadily from USD2.9 billion in 1993 to USD58.4 billion in 2016. He also highlighted that India, which is located strategically along important sea-lanes from the Indian Ocean to the Pacific, was integral to the security of South East Asia and said he was heartened as the discussions during the two-day conference had highlighted the huge potential for further cooperation between India and ASEAN. He highlighted three areas on which to focus on. “Economic integration through regional trade agreements such as the Regional Comprehensive Economic Partnership (RCEP), are building blocks to integrate the Asia-Pacific as a common market and production base; expanding connectivity between India and ASEAN by air, land and sea and co-operation in digital technologies can form a new frontier in our relationship,” he said. 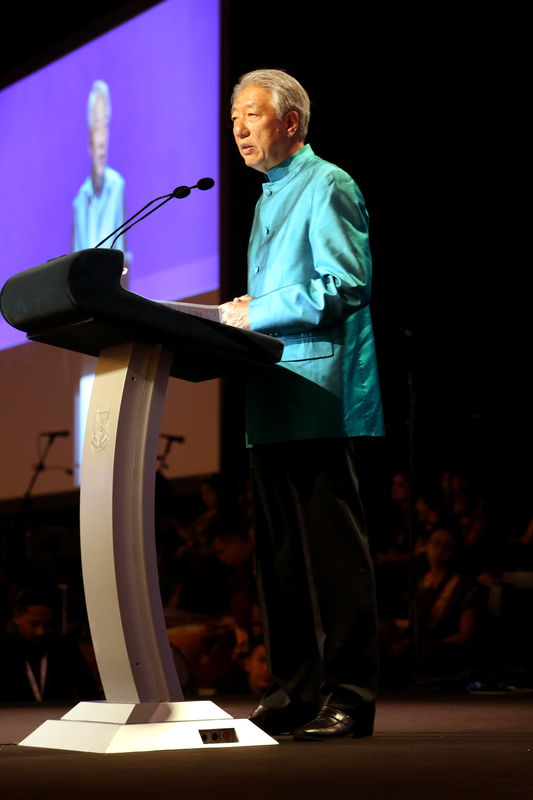 He added that Singapore has played a key role in catalysing India’s engagement with ASEAN in the past 25 years, and is uniquely positioned to facilitate even closer ASEAN-India relations. 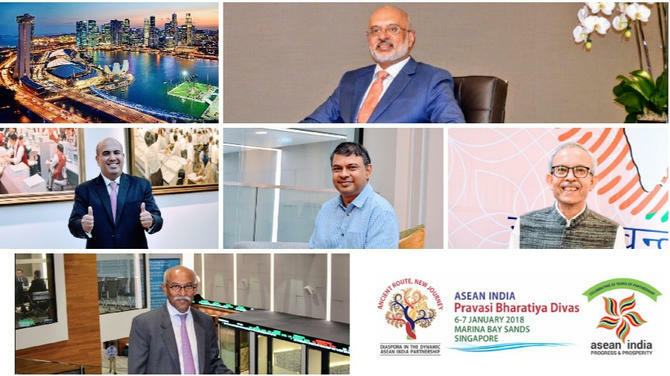 “As a civil aviation, trading and financial hub, we are a good base for Indian companies to work from in order to expand to Southeast Asia and beyond,” he said, adding that many multinational companies have their regional and global headquarters in Singapore.